Any time you are away for a month there is a long list of chores upon your return home. While I had plenty of nitty gritty things to get done, I couldn't help but feel responsible to check on our local NH rivers. So after a morning of doing laundry I grabbed the dog and headed to a local stream. My nymph rod was still rigged with an Arkansas midge and mega-worm so I decided to give that combo a try in NH. It wasn't long before I was hooked into a fat 16" rainbow. Shortly thereafter I missed some smaller trout before catching one that turned out to be an eight inch wild brook trout. I was happy to see a few fish biting this early in the season. With recent rains there should be plenty of trout moving from our lakes into local rivers and streams. April and early May provide a great window to fish for these larger trout in an intimate setting. We are now booking for April and May. 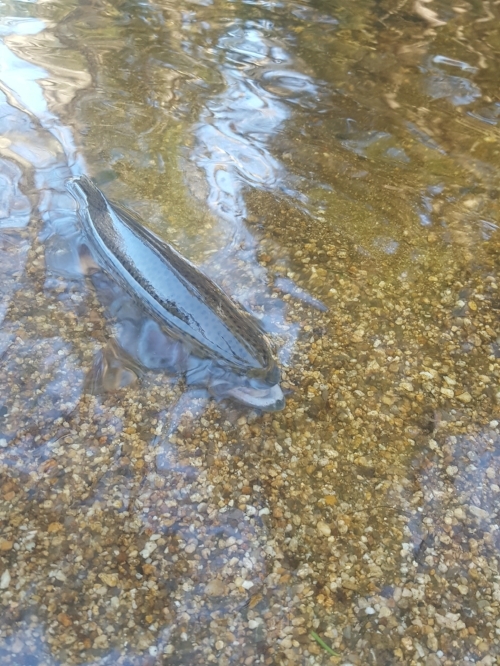 NH Spring run Rainbow trout. On Tuesday I decided to check on some bigger water for bigger fish. I had a hunch that the big browns would be hungry and I suspected that a warm midday sun would provide a bite window. I grabbed the dog and headed out to a slow pool where I knew large fish spent the winter months. I tied on a smaller streamer that I had designed for low water Arkansas browns and began making long casts sweeping through a depth change in the middle of the river. It might have only been my third cast when my line went tight. I stripped hard hoping it wasn't a snag, then the throbbing started and I knew...big brown. Fish like these require a pause in the fishing. One takes his or her time admiring the catch and releasing the fish. Then watches the water, thanking the river for showing us a glimpse of her mystery. As I watched another large brown rose to the surface, inspiring me to begin casting again. I never did see that second fish on the end of my line and shortly thereafter the air temperature dropped and the wind picked up. Although I kept casting I knew the brown trout were done for the day. Early season, or I should say "off season" fishing is often this way. With cold water temps and short periods of warm weather the "Bite" is often short lived. Still it is important to remember that the biggest fish in the river, those that need to consume the highest quantity of calories, will be the first to eat. Conversely these are also the smartest fish in the river who eat the fewer, but bigger meals. Thus early season angling takes a patient calculated approach. It often involves a constant eye on the weather, barometric pressure and wind direction, and then a deliberate conviction of when and where to fish. You must have confidence in your quest. This is not the time of the year to catch a lot of trout. It is the time of the year to hunt for THE ONE. I use the term hunt instead of fish, because in order to be successful you need to think about this endeavor as a hunt. If you land one it is a success, and if you don't you take what you have learned into your next hunt. We feel confident that we've learned enough to know when and where the hunt will give anglers a shot or two at success. I've spent enough time on trophy brown trout waters to know that these fish will eat when they want to eat, not when you want them to eat. Figure out those times, and places and you will be greatly rewarded. If you would like to learn more, and join us on a brown trout hunt, we are currently booking. Flows and temps look to provide good bite windows through April and May this year. We look forward to hunting with you.